Intelligence Reconnaissance Surveillance - Polaris Sensor Technologies, Inc.
Intelligence, reconnaissance, and surveillance (ISR) is central for gathering and processing information taken from weather on a battlefield, a police stakeout, or many other commercial situations. Although collecting information in the visible spectrum can be helpful, it leaves untold amounts of information still ungathered — especially in low-light or night-time scenarios. Failing to amass necessary data may lead to mission failures, poor target identification, monetary losses, and even fatalities. Through the use of polarization enhanced thermal imaging sensors, information will no longer be sparse. Polaris’ eTherm will detect anything from power lines to disturbed earth. With this new higher level of intelligence gathering applications could range from flight planning to IED detection. Surveillance typically involves monitoring the behavior of targets (people, vehicles, etc.) for the purposes of managing or protecting particular interests, while reconnaissance focuses on obtaining information about threats by visual observation and detection. In general, surveillance refers to remote monitoring while reconnaissance refers to sending a team of scouts to gather information. Polaris’ eTherm Technology is a practical method to improve solutions for both surveillance and reconnaissance applications. eTherm Technology is accomplished with a special camera that dramatically improves image contrast of standard thermal imagers. In the figure, a tank is driving away from the observer in the center of the screen. The tank has reached “thermal equilibrium” and appears washed out in the standard thermal image. 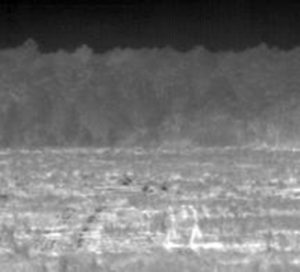 Now, hover over the image to see how eTherm reveals the tank’s position and its path which are otherwise missing from the thermal image. The goal of eTherm is to improve the performance of electro-optic and infrared optical sensors. This is particularly useful to help improve target detection range by reducing surrounding clutter. Since eTherm can greatly raise the detection threshold of manmade objects against natural backgrounds, it is well-suited to detect vehicles, including tanks (above, left) and trucks (below). This technique is robust in all parts of the day/night cycle and against a variety of natural backgrounds (sky, dirt, sand, grass, bushes, trees, etc.). Try eTherm. 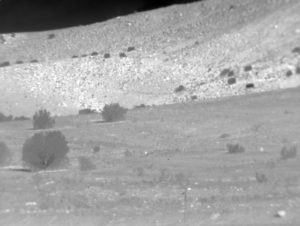 In the image to the left, a desert scene with various foliage is shown from a standard thermal infrared camera. Can you identify the vehicle within the scene? Now, hover over the image to see the eTherm image. It is apparent that eTherm greatly enhances the otherwise thermally camouflaged vehicle making it easy for an operator or an algorithm to detect the vehicle. In addition, notice that the vehicle’s path is also evident, perhaps alerting the observer to the vehicle’s past actions. While these examples primarily focus on military vehicles and applications, the principles are transferable to the commercial sector as well. With the advances of autonomous vehicles, drones, and mobile devices, eTherm is an attractive solution to help solve problems with detecting vehicles in otherwise challenging scenarios. See the navigation and safety pages for more information regarding commercial vehicle detection applications for eTherm. The maritime environment presents its own set of challenges and opportunities. Targets of interest are not always easily discernible to the human eye and even less so to a computer algorithm. Even when a target has been identified, gathering actionable intelligence as to the height above water (freeboard), ship length, and general identifying features can be challenging as shown in the figure on the left. 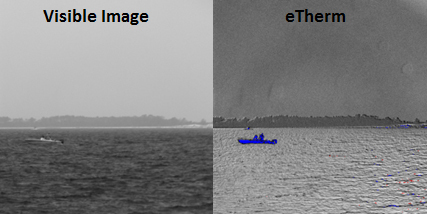 By using eTherm technology, the targets are readily located and even silhouetted facilitating automated target detection, recognition, and identification as shown in the figure on the right.Using a simple adaptive threshold on the eTherm imagery, Polaris was able to detect and outline the boat, the boat engine, and a person standing in the boat. Additionally, another vessel is seen behind the first boat against the treeline. These images were taken in good visibility conditions. eTherm Technology allows you to see the world differently. This capability is useful for detecting manmade objects against natural clutter. In the image to the left, a park scene is observed from an aerial platform. In the scene, there a number of metal plates which have been camouflaged both visible and thermally. The data product shown is what you would see from a standard thermal camera. Without prior knowledge of the object placement, it is nearly impossible to determine the number and location of the metal plates. Note that while we are observing plates in this example, the technology is transferable to other metal or manmade objects. This sensing modality is robust against camouflage, canopy obscuration, shadows, and can operate in day/night. How many metal plates are in the scene? Try eTherm. Hover over the image now to find strong negative contrast signature for the five metal plates. In addition, a dynamic threshold and segmentation algorithm has been applied to highlight these threats to the user. In this example, these metal plates are harmless, but most threats in the military world are metallic and/or manmade and are sometimes difficult to spot against the natural background using standard visible and thermal (or night-vision) devices. Thus, eTherm is an attractive solution to many military threat detection problems. The above image is how we at Polaris typically view eTherm (and how an automated detection algorithm would identify threats), but we have found that real-world operators like to have a fused dataset to help visualize the world. Because of this need, Polaris has developed VectorColor, a technology which helps you see the world as we do. VectorColor works by fusing both the thermal (or visible) image with the eTherm data product, with the standard data product given in black/white and eTherm provided as a color enhancement. The technique is shown in the example below. 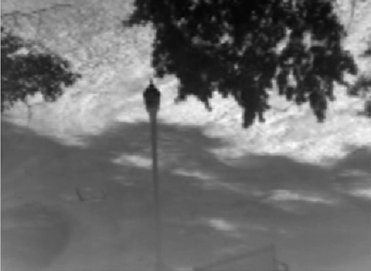 Again, the same thermal image is shown of the park. However, when you hover over the image, notice how color is added to the black/white scene, adding enhanced significance to the manmade threats. Thus, the thermal content (light post, trees, bench) is still available, but the targets are highlighted using color as the attention grabber instead of negative contrast. The threat contrast is maintained in this VectorColor data product. Both eTherm and VectorColor were developed by Polaris primarily for military threat detection. However, there are many commercial applications which may make use of these solutions. The areas of navigation (detecting obstacles in the roadway), surveillance, and security are specific business areas which Polaris is expanding its eTherm and VectorColor technologies. See the navigation, surveillance and reconnaissance, or safety and security pages for more information. Or, contact Polaris today for more information about how eTherm or VectorColor can help you see things that others cannot. Another military application for eTherm is weapons and projectiles. eTherm can improve the signal-to-noise ratio of these objects, enhancing detection likelihood and range. For instance, note the image sequence to the left of a missile cone imaged using a traditional EO/IR imaging system. The top image is taken from a standard visible camera, while to middle image is taken using a standard infrared thermal camera. It is clear that the cone will generate a good signature due to its shape and emitted heat. However, the eTherm image provides a view which enhances the standard thermal image, providing information about the geometry of the object, its orientation, and its perspective to the viewer. Remember, eTherm does not replace the traditional thermal imager, but instead adds additional information that can augment and upgrade the observer’s knowledge of the weapon being observed. This knowledge can be used to advance beyond current detection, tracking, and recognition (matching) algorithms. In many missile and projectile detection scenarios, engagement timelines are short, thus acquisition range is a critical parameter. The sooner one decides to engage the threat, the more time you have to act, thus improving probability of success. One key contribution of eTherm is the ability to distinguish between plume and hardbody. To a thermal imager, the plume will dominate the signature and it is difficult to distinguish between plume and body. However, eTherm will mostly ignore the unpolarized plume while presenting the geometry of the hardbody as an added contrast mechanism.